Hello, my dear iPhone users! Are you a driver? How often your phone distracts your attention from the road and other vehicles on it? Can you remember? Well, today I’d like to talk to you about that, and share some knowledge on making your road trips more comfortable and safe. Surely, you know that not looking at your phone while driving is about your own safety. And it is always better not to be interfered by messages or calls. So, Apple included a special mode called 'Do not disturb while driving' to the latest iOS versions. As you could already understand from its name, this feature is needed for comfortable driving without hearing SMS messages, incoming calls, alerts or notifications from your iPhone. It is similar to a usual 'Do not disturb' mode. The main advantage of it is ability to send replies automatically. Your phone will tell others that you're driving at the moment and will contact the sender/caller as soon as you stop somewhere. The excellent news is that this mode can be turned on automatically after your iPhone connects to car stereo system's Bluetooth. It also can be activated when the phone detects movement and motion activity that is usual for driving. Alternatively, you can turn it on by yourself. 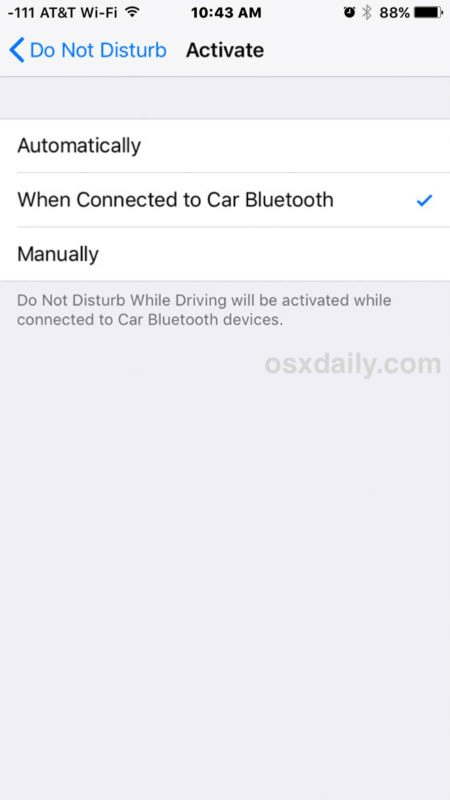 How to activate 'Do not disturb while driving' feature by hands? For doing this, an iPhone with one of the latest iOS versions (iOS 11 or later). Visit 'Settings' and find 'Do not disturb'. Search for the 'Do not disturb while driving' line and choose 'Activate'. -Automatically. It allows your iPhone to detect motion and turn the feature on its own. -When connecting to a car Bluetooth. As for me, it is a nice option of the car Bluetooth system, and I use it exceptionally for this purpose, but not for listening to the music via Bluetooth. The mode will turn on after connecting to it. -Manually. You can control when this feature is on, and when it's off. Go back to the 'Do not disturb while driving' settings, find 'Auto-reply to' and choose the contacts who will receive auto-replies while you are driving. Customize response messages in the 'Auto-Reply' section, if you want. That's all! Your 'Do not disturb while driving' mode is configured now, so you can start using it after you begin driving. No calls or messages will distract you, and that's great! Still, your iPhone will receive all of them. This mode is obvious on the lock screen (this can be seen on my screenshot). The message will state that you won't receive alerts and notifications while driving. Tap on this line to turn the mode off temporarily, if you need that. As I've said before, I find ideal the option when this feature turns on after connecting to the stereo system via Bluetooth. So, it won't activate while you are a passenger in another car, while the 'Automatically' option may think that you're driving and turn it on. Yeah, iPhones become smarter with every upgrade, still, they can't guess whether you're piloting your can or drive like a passenger with your friends. Anyway, this option is the only automatic way to turn the 'Do not disturb while driving' mode, if you don't have a Bluetooth stereo system in your vehicle. So, toggle it, if you don't want to take manual control on this feature every time you drive somewhere. Configuring the mode is similar to general 'DND' settings. Here, you can also set up the emergency bypass for some contacts. You can choose the ones that will break through this mode and you will notice the alert, if they call of message you. 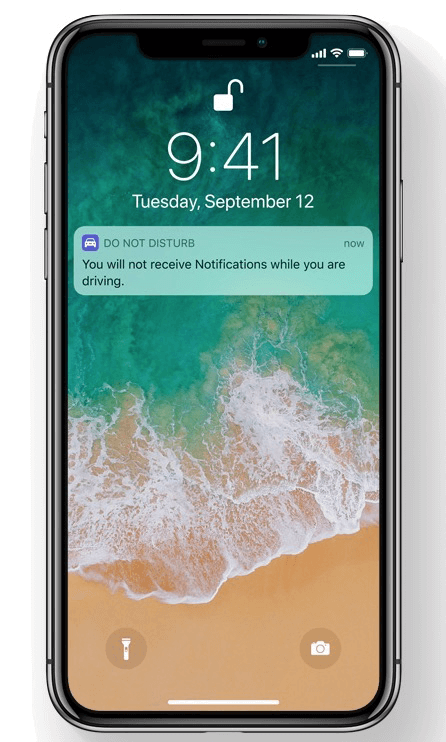 Their notifications will show up on the iPhone screen even if the 'Do not disturb while driving' mode is on. Btw, you might probably noticed this feature for drivers as you were setting up the new iOS on your iPhone, but skipped it for some reason. No worries! You can always come back to it and set it manually in the way I shared above. Grab this instruction, your iPhone and turn it on! So, as a conclusion, I can say that this mode is very useful and can really improve the safety of everyday traffic. There are many accidents caused by distracted drivers. Taking a phone in your hands while driving is dangerous, and it can harm you and others. So, try not to look at your iPhone while driving and create a habit of turning this handy mode on every day. I hope that my article will save you from unnecessary mistakes on the road. Drive carefully and enjoy this new iOS feature!